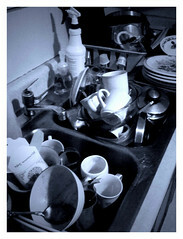 This is a photo of my kitchen sink in all its chaotic glory. Fortunately for us, this is an aberration. How could we function with a sink like this on a daily basis? So glad it's only every other day. Ha! You think I'm kidding. I must admit, however, that last night the sink looked just like this, except without all the artsy high contrast. And it wasn't so blue. At any rate, I discovered to my amazement that every utensil & cup in our home had migrated to the sink and gathered a sedimentary layer of sticky food on their journey. I had no choice but to run a load in the dishwasher. As I braced myself for the tactile onslaught, I mused what it would be like if my life was as easy to correct as a cluttered sink. With a healthy dose of AD/HD, my world often looks just like this sink to the outside observer. Especially since I have that charming tendency to open my mouth and reveal far too much about my life than is comfortable for most people. I recall a book signing recently where I was chatting with an author friend and mentioning in passing the high amount of drama I had been dealing with—referencing an earlier email. 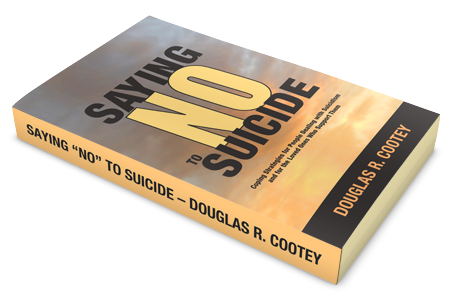 Fortunately, I hadn't planned on saying anything more than that, but I didn't move on before noticing the pained, panicked look in her eyes as she began to edge towards the exit, then the relief when I didn't say anything embarrassing. Well, this week has been that kind of week. Everything has been just on the verge of becoming a problem, but thanks to my ADHD super intuition powers I have snatched defeat from the jaws of victory, or something like that. The same powers are coming to the rescue of this blog. You may have noticed I've been trying out a few new features lately. Some I'll keep; some I'll toss. The Free Money Monday was a great success, but now I'm broke so I'll be dropping that feature. 'Musing Monday was fun, too but didn't fit this blog so I'm moving it over to my Twitwall account. You can play along if you follow my @DouglasCootey account on Twitter. Free Book Friday has been a success as well, but is in jeopardy of being dropped. I've had lots of new people drop by. I mailed out some free books which cost me shipping charges, and then the contestants never visited again. Yep. Super successful. Of course, it could be NaNoWriMo that has stolen them away, but since I was giving books away to generate comments here on the blog and instead saw a drop in comments this week, I wonder if offering strangers free books is a good use of my time. I can achieve the same results by tossing the books into passing pickup trucks out in my front yard. At least my writing has been a success. I finished the rough draft for my "Secret Cat Project" last month. Now I've begun fleshing out the first draft, and I have to admit I'm fairly excited with my progress. 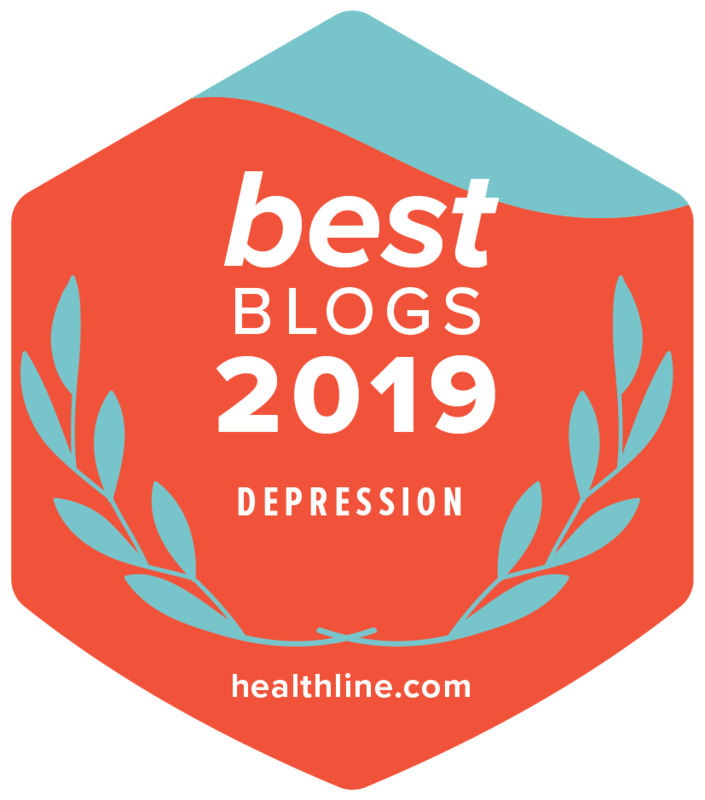 Part of the purpose of this blog is to chart my success against the forces of Depression, AD/HD, and Chronic Motor Tic Disorder. Slowly, I am carving out a productive life for myself and maybe even finishing a project or two while I'm at it. And that's my week or so in a nutshell. 1) What is the most embarrassing thing you've read on this blog? 2) If you had to fit your life in a nutshell, which nut would suit you? Icy still needs to respond with her address soon for "Heck Superhero". I suppose I'll make a new rule going forward. The winner has a week to contact me or the prize will be up for grabs again.